The recruitment drive in the Top 14 Orange is still in full flow with Toulon confirming two high profile signings. 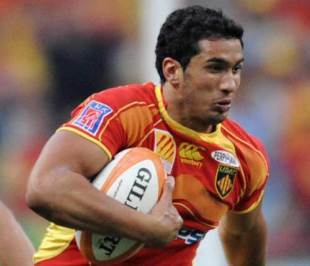 French international centre Maxime Mermoz has committed to a one-year deal and joins from fellow top-flight side Perpignan. Toulon have also completed the signing of former Toulouse half-back Frederic Michalak on a two-year deal. Toulon owner Mourad Boudjellal said that Mermoz faced a tough decision over where his future lay. "It took a long time. He was hesitating between staying at Perpignan, going to Montpellier or coming to Toulon," Boudjellal said. "But when he said yes, it all happened very quickly." With the Top 14 transfer window opened on Friday, the Top 14 sides have been announcing a raft of new signings. In other news, relegated side Lyon are believed to be on the verge of bringing in veteran lock Lionel Nallet. He will once again link up with Sebastien Chabal with the No.8 quick to emphasise that contrary to public belief, they are not joined at the hip. "We're not married, contrary to what the press would lead you to believe," Chabal said. "Our careers have never been linked but they have often crossed paths and we've played together a lot, which has been a pleasure." Elsewhere in the Top 14, Castres have announced the recruitment of Hurricanes half-back Daniel Kirkpatrick on a three-year deal.